Welcome to Marilize Spa & Beauty Clinic - situated in the heart of the Klein Karoo, Oudtshoorn. Our spa is nestled in town centre near all accommodation establishments and restaurants. We offer a place of rejuvenation, relaxation and total renewal. Forget about everything and become totally renewed - body, soul and spirit! 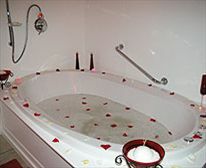 Our Facilities: We have private Treatment Rooms, Hydrotheraphy and Ozone Theraphy Bath, Shower, Sauna and Tanning Unit. Our Treatments include Massages, Hot stone theraphy, Body exfoliations, Body wraps, Ionic detox foot spa & infra red slimming, Hydrotherapy & ozone theraphy bath, Infra red sauna, Clarins pro face & clarins pro body lymph draining, Clarins men, Delux treatment manicures & pedicures, Selection of salon service treatments, Complete bridal treat, Make overs, Bio sculpture nails, Day packages & Couple theraphy. Per person (2hrs). Mud me, I’ll mud you, Followed by a romantic shower Infrared Sauna. Feed me, I’ll feed you in the Hydrotherapy Bath whilst sipping a cocktail. Blind fold me with a peel off Mineral Eye Mask and Bust Peel Off Mask. Massage me - I'll massage you. Rate subject to change without prior notice. Per person (3hrs). Clarins Pro Body Exfoliation, Energizing Scalp Scrub, Shower, Infrared Sauna, Soak in Hydrotherapy Bath whilst sipping a cocktail & Full Body Hot Stone Massage. Rate subject to change without prior notice. Per person (1hr). Infrared Sauna, Ionic Detox Foot Spa and Infrared Slimming & Ozone Therapy Bath with Aroma Oils. Rate subject to change without prior notice. Per person (2h45min). Detox in the Infrared Sauna Room with a scalp & hair mud mask, followed by a Salt Scrub and a Shower. Relaxing Back, Neck & Shoulder Massage. End of with a soak in the Hydrotherapy or Ozone Therapy Bath whilst sipping a cocktail. Rate subject to change without prior notice. Per person (3h45min). Healthy Meal – Breakfast or Lunch, Hydrotherapy or Ozone Therapy Bath with Aroma Oils, Relaxing Back, Neck & Shoulder Massage, Clarins Pro-Facial & a Pedicure. Rate subject to change without prior notice. Per person (2h35min). 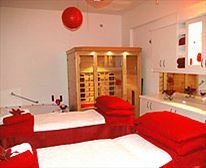 Healthy Meal - Breakfast or Lunch, Hydrotherapy or Ozone Therapy Bath with Aroma Oils, Clarins Pro-Facial, Full Body Hot Stone Massage & a Manicure or Pedicure. Rate subject to change without prior notice. Per person. 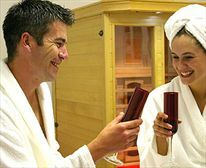 Healthy Meal – Breakfast or Lunch, Hydrotherapy Bath with Aroma Oils whilst sipping a cocktail, Relaxing Back, Neck & Shoulder Massage, Clarins Pro Facial, Manicure, Pedicure & Bridal Make-up on Wedding Day (Trial Make-Up). Rate subject to change without prior notice. Per person (2hrs). Dead Sea Detoxifying Mud Wrap, Detoxifying Hydrotherapy or Ozone Therapy Bath & Detoxifying Lymph Drainage Pro Body Massage. Rate subject to change without prior notice. Per person (45 min). Sea Of Life Shampoo & Conditioner (magnesium rich mud Almond), Centaurea Hair Mud Mask & Tension Release Scalp Massage. Rate subject to change without prior notice. Per person (2hrs). Sea Of Life Vanilla Salt Scrub, Shower, Dead Sea Detoxifying Mud Wrap with Coffee & Peppermint and a Hydrotherapy Bath with Aroma Oils. Rate subject to change without prior notice. Per person (2hrs). Infrared Sauna with shower, Muscle Ease Massage & a Mini Facial or Foot Massage. Rate subject to change without prior notice.